Matrix saddle pads and 90% of the materials used to make them, are made in the United States. The design of these pads is based on the latest ergonomic research and insights pertaining to the dynamics of equine physiology. SlypnerGear stocks both pads in the Matrix Endurance Series. We sell the pads in separate components. This allows YOU to choose exactly the pad for your needs. We think this could save you a little bit of money...You can have a single pad to use as is. Or, you can use it as a cover/shell with a variety of inserts, to use as needed. Or, you could have a single insert and a variety of covers, to use as needed. Matrix ENGLISH Endurance pads will fit saddles that have a panel length of 22” or shorter. The total dimensions are 24"L x 40"W.
The top is a linear quilt of etc™ Fabric. This fabric provides a non-slip surface with a great grip. It allows very good heat dissipation and air flow. It is stain resistant and easy to clean. A long Velcro top pocket allows you easy access for placement of your Matrix inserts, if you choose to use them. The center of the pad is a pair of Matrix inserts. The pad has a pocket on each side, for placement of the Matrix inserts. This type of placement reduces the pressure and contact on your horse's spine. There are THREE AVAILABLE CHOICES of Matrix inserts. At SlypnerGear, we sell the inserts separately. This single layer of low density viscoelastic foam is 25mm thick. Choose this insert for cushioning while working on low impact conditioning and muscle development. This foam mimics the density of muscle tissue, offering a wide supportive base and helps prevent restriction or inhibition of muscle movement from your saddle. It does not dissipate heat as well as the Pro-Impact pad. A layer of 5mm thick high density Poron® XRD is supported by a 12mm thick layer of medium density viscoelastic foam. Choose this insert for cushioning and impact reduction. It also is a good choice for stabilizing your saddle. Poron® XRD provides extreme impact protection, absorbing 90% of the most intense force. It protects the horse from impact AND it also reduces the bounce felt by the rider. It is comfortable, flexible and lightweight. It will not break down over time. This is the layer that provides the impact reduction and pressure distribution. The viscoelastic foam is the layer that provides the cushioning. Both layers will contour to your horse very well. This pad does not dissipate heat as well as the Pro-Impact pad. A layer of 5mm thick Poron® XRD is supported by a 13 mm thick layer of high density Poron® XRD. Choose this insert for cushioning that is least likely to bottom out and for providing superior impact and bounce reduction. Both layers are perforated and provide the BEST heat dissipation. The final layer is the part that contacts your horse. A fleece bottom is bi-level: 1" Coolback pile under the saddle, 1/2" Woolback pile behind your leg (for improved heat dispersal). 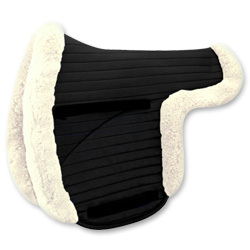 At SlypnerGear we have this pad with a COOLback fleece bottom, in stock. COOLBACK™ Fleece is a synthetic orthopedic fleece. 1” pile provides ideal density for concussion reduction and comfort and easy air circulation. It is machine washable and dryer safe. Endurance riders who have been involved in the testing and development of the Matrix Endurance Saddle Pad System are Valerie Kanavy, Ellen Olson and Jeremy Olson.